Flood risk management, fresh water supply, energy, telecommunications, defense, transport and infrastructure are all examples of fields with challenges related to deep uncertainty. Many investment and policy decisions in these and other fields have significant and often long-term consequences. Moreover, long-term objectives often require near-term decisions. Making sound near-term decisions is critical, yet we live in an increasingly unpredictable dynamic world governed by competing and changing beliefs and preferences. When decision makers and analysts face a deeply uncertain future (e.g. due to climate change), they need more than traditional prediction or scenario-based decision methods to help them to evaluate alternatives and make decisions. Fortunately, there are new methods and tools that can help them to make sound decisions in the face of these challenges. 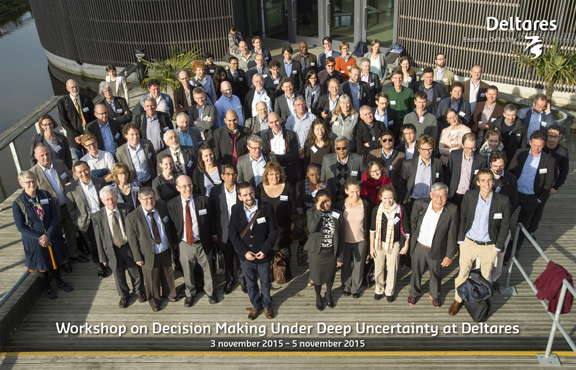 The 3rd Annual Workshop on Decision Making Under Deep Uncertainty, will be held in Delft, the Netherlands, on 3-5 November 2015. This workshop will build on the first and second workshops which were held at the World Bank in November 2013 and at the RAND corporation in November 2014. It seeks to foster a community of practice around decision making under deep uncertainty, in order to share new developments in methods and tools, lessons from their applications, facilitate their use in practice, and ultimately encourage sound (public or private sector) decision making. The theme of this year’s workshop is “From Theory to Practice – Implementing Deep Uncertainty Methods and Tools”. It will focus on exchanging views: between researchers and practitioners, among different fields of interest, and among researchers. The workshop is hosted by Deltares, Delft University of Technology and UNESCO-IHE. The workshop will include plenary talks, break-out sessions structured around methods and tools for dealing with deep uncertainty, tool demonstrations, and practitioner discussions. Marjolijn Haasnoot, Deltares/Delft University of Tech. Jan Kwakkel, Delft University of Tech. Here you can download a pdf file with photos taken during the workshop.